Bring Spring earlier into your home when you make your own faux peonies, following this easy peasy DIY paper peonies tutorial! 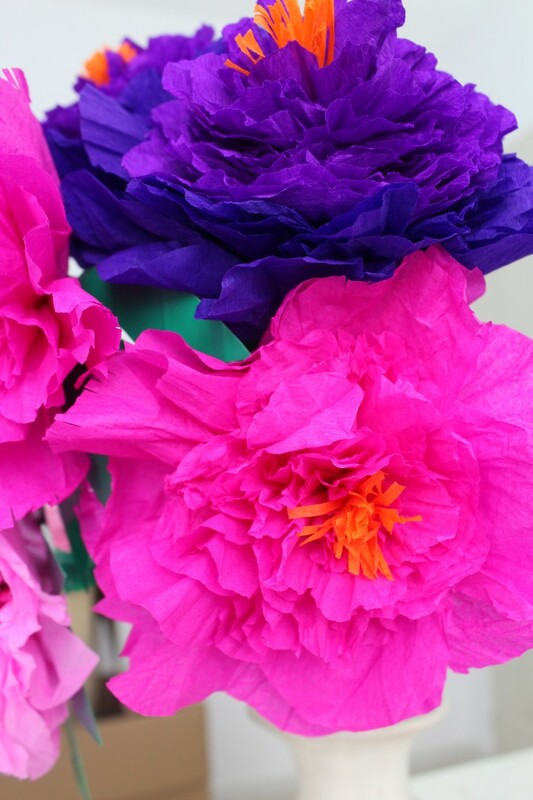 These crepe paper peonies are not only super adorable but will last for a long time! 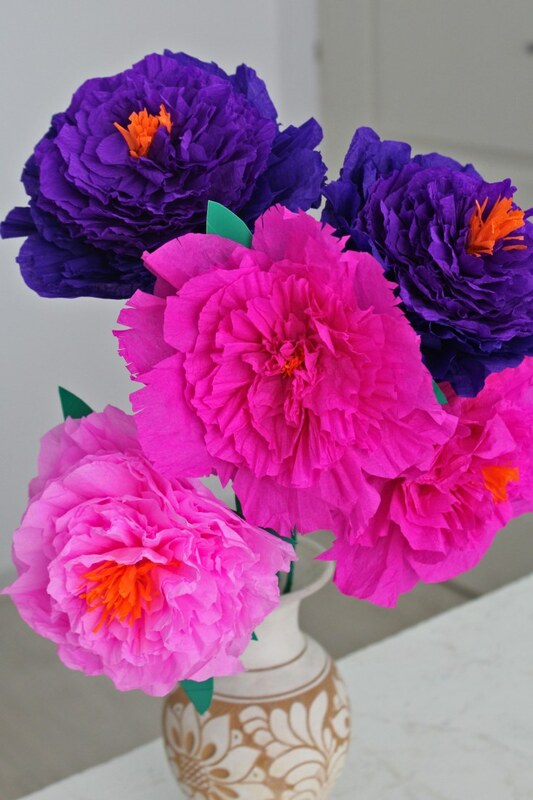 I bet you thought these artificial peonies are the real thing! Just kidding! 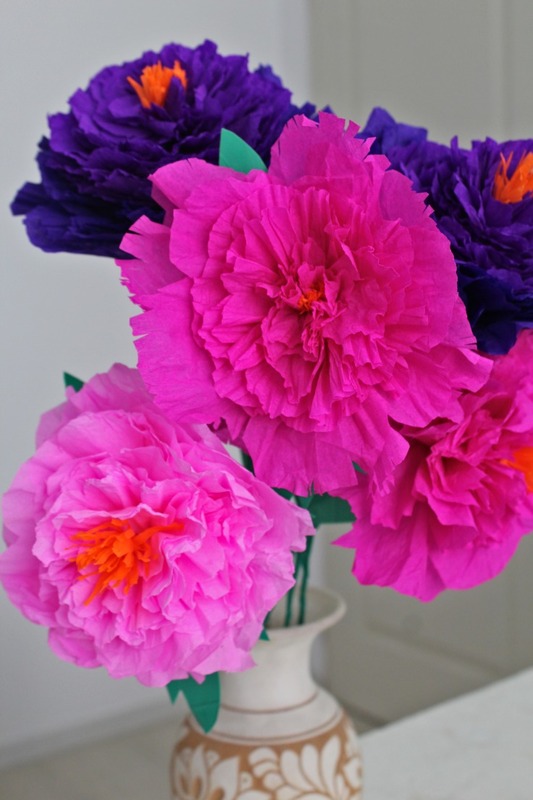 I am completely aware my DIY paper peonies are far from perfect but I absolutely love them! They look so bright and cheerful and make me feel like Spring is here! I love making fake flowers but I so lack the patience! 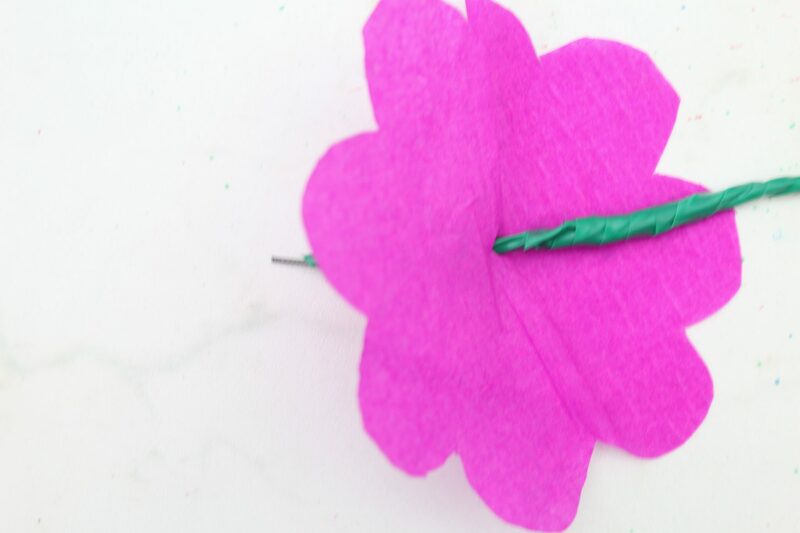 I can’t spend hours cutting thousands of petals and gluing them one by one, I need something real quick, a faster and better method! 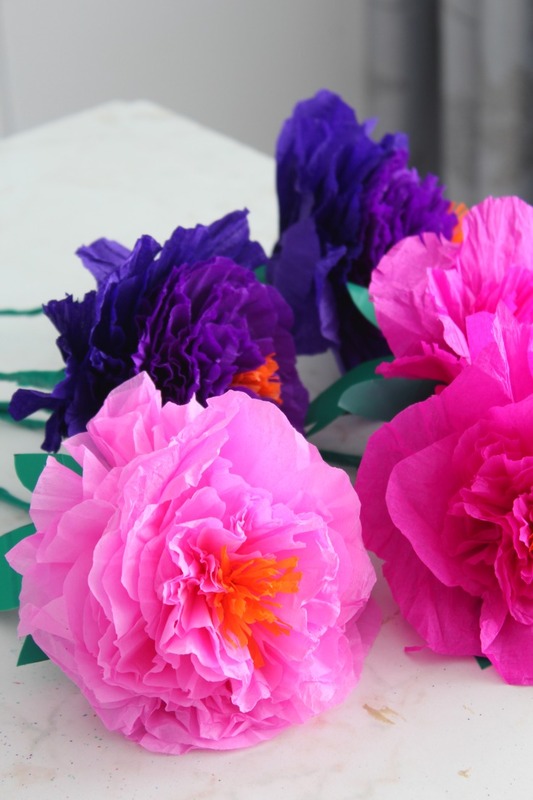 And that’s how I came up with these DIY paper peonies. 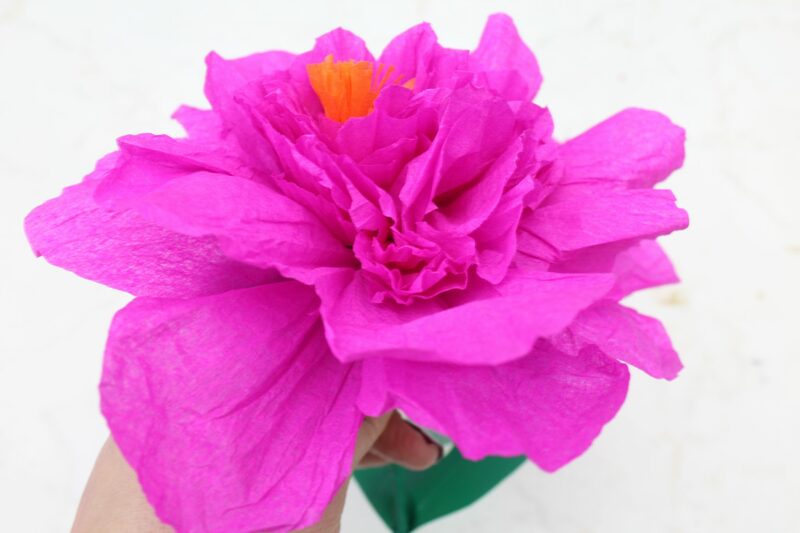 They’re made out of crepe paper but not individual petals but more like a large flower template that is then scrunched and twisted into a peony. I made three templates and got to work with all of them but I think the large template works best for these crepe paper peonies. And the more layers you use, the better your peony will look. 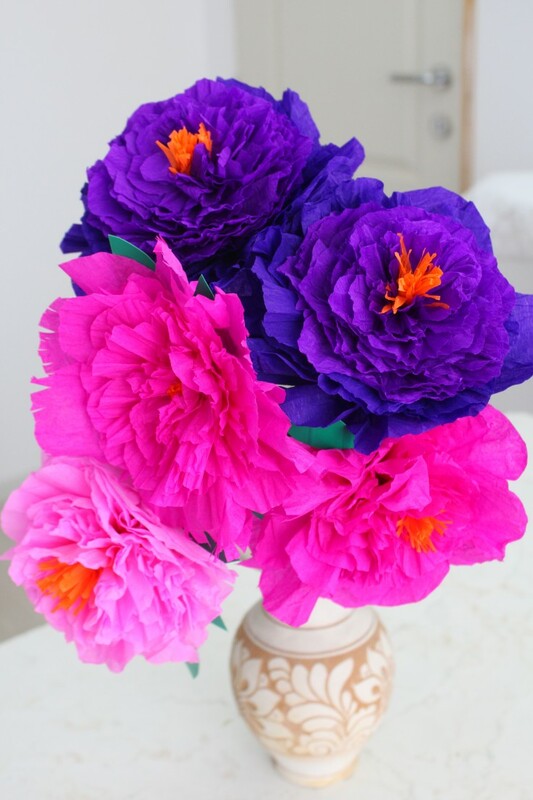 Unfortunately I didn’t have a lot of crepe paper in the colors I loved so I had to be “stingy” to make my supply shape into five beautiful, eye catching DIY paper peonies! On the light pink peony I used 16 layers (8 large, 4 medium and 4 small). 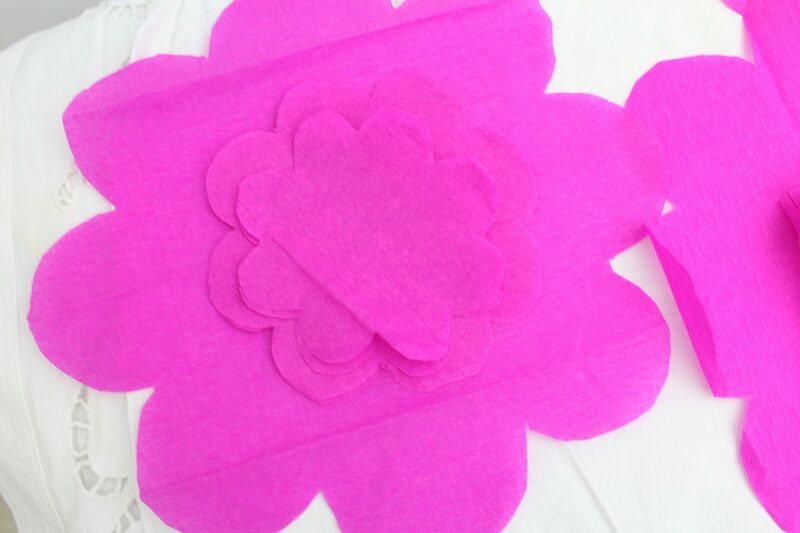 For the fuchsia pink peonies I used 12 layers (4 large, 4 medium & 4 small). On the purple peonies I used 20 layers (4 large, 8 medium & 8 small. Each of the peonies have a fringed middle in orange crepe paper and a few of them also have leaves (I made a template for these too). I didn’t have paper in the color of the tape I used to wrap around the stems of my faux peonies so I decided to get creative! I used the same tape to tape a piece of cardstock, drew the leaves patterns on and cut out so now the leaves are in the exact same color as the stem. Plus they were sturdier and easier to shape! 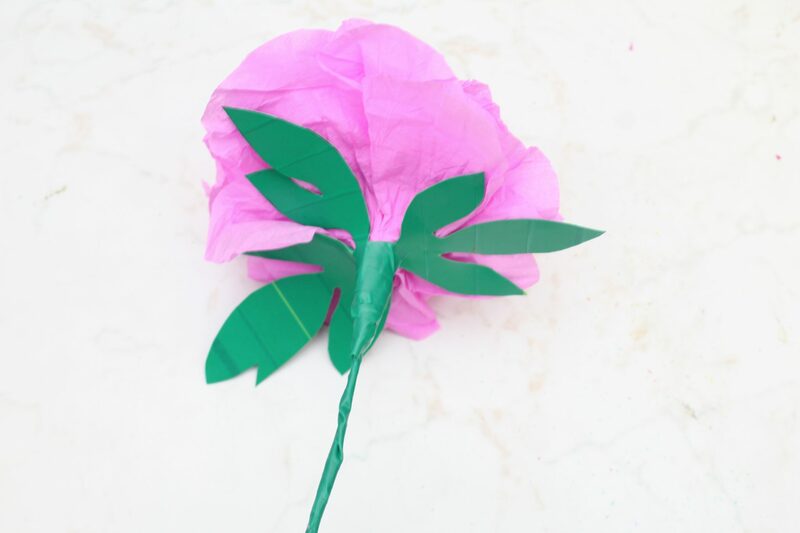 Another tip I would suggest now, learning from my mistakes is to separate the petals on the outermost layers and fold them towards the inside. 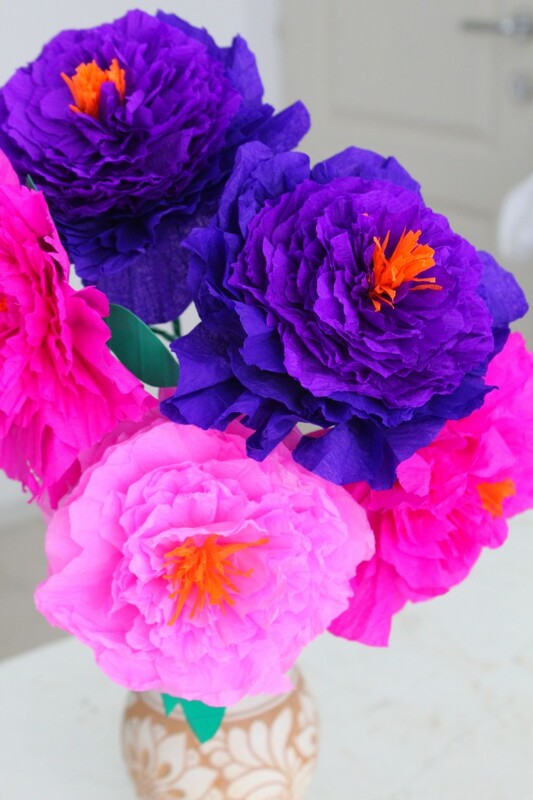 I think this would help your DIY paper peonies look less artificial and more like the real thing. The templates for these peonies can be purchased here or get them free when you join my craft newsletter! 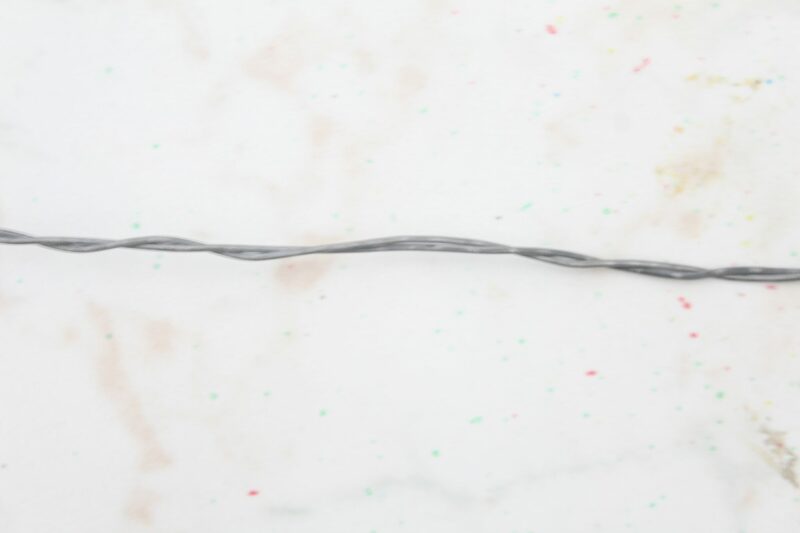 You’ll use the wire to make the stems so grab your cutting pliers and cut as many wires as needed for the amount of peonies you plan to make and then double the number. Take two at a time and wrap the wires around each other. 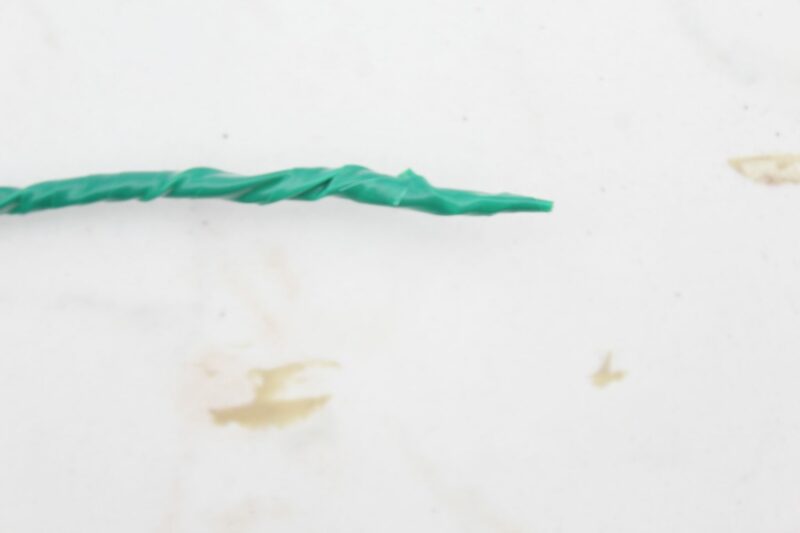 Get the green electrical tape and wrap it around the twisted wires leaving one end exposed and covering the opposite end. 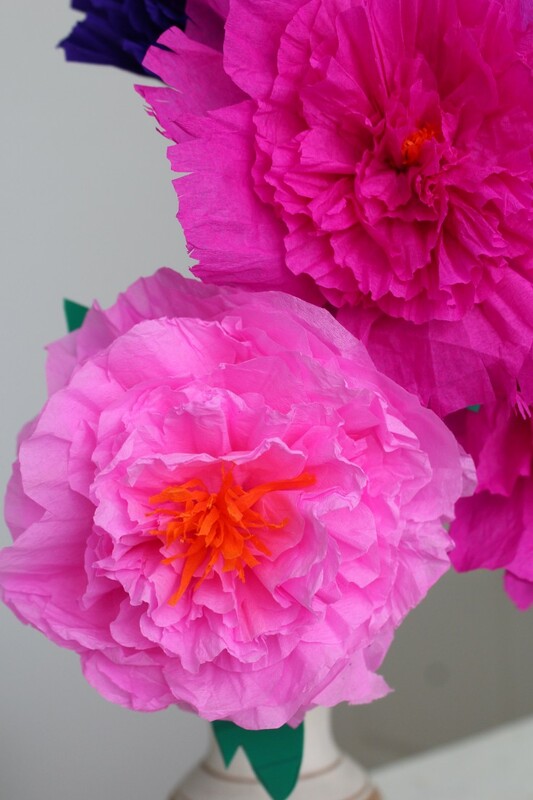 Stack up a few layers of crepe paper and place the peony templates on the crepe paper. Pin the template to the paper so it won’t slip and start cutting out. Make as many layers as you like, in the size you love best. A couple of smaller ones look best in the middle though so you might wanna try those too. 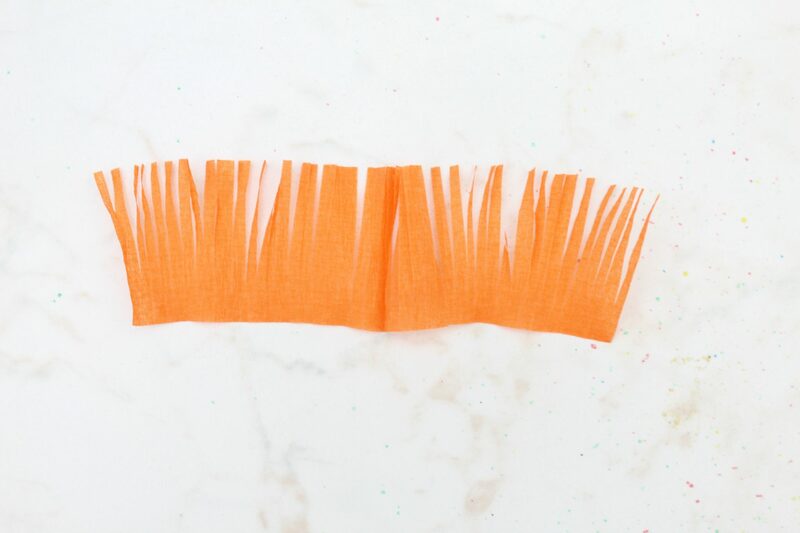 Grab some orange crepe paper, cut a few squares of about 2″ x 4″ and fringe along one of the long sides. 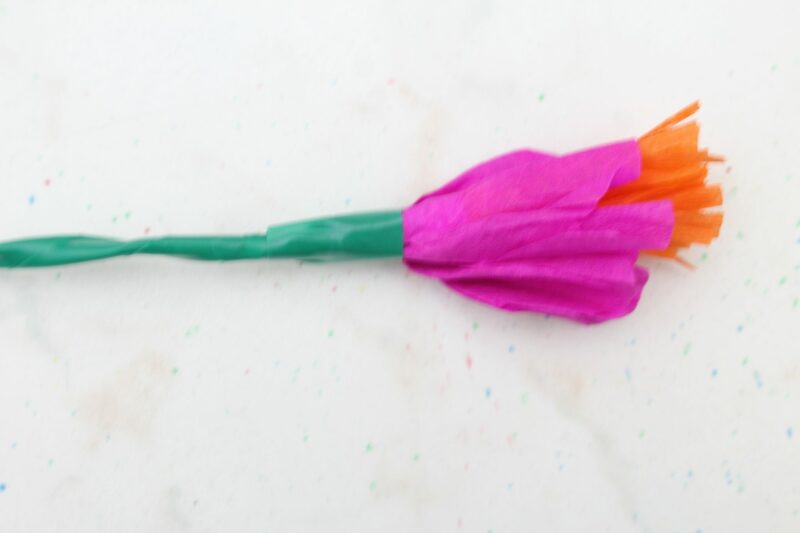 Start making your first flower. 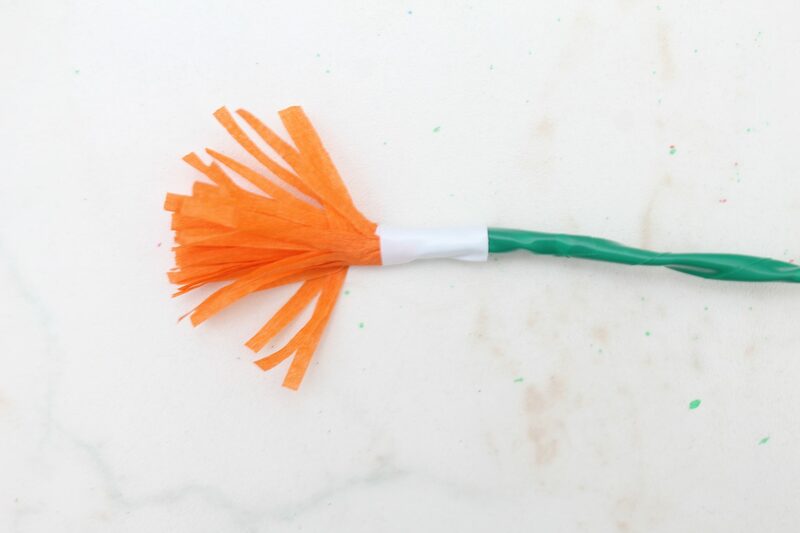 Get one of the fringes and wrap around the taped end of the stem until all fringe is finished. Tape onto the stem using green electrical tape (I find this is very stretchable and bendable and a lot easier to work with than other kind of tape). 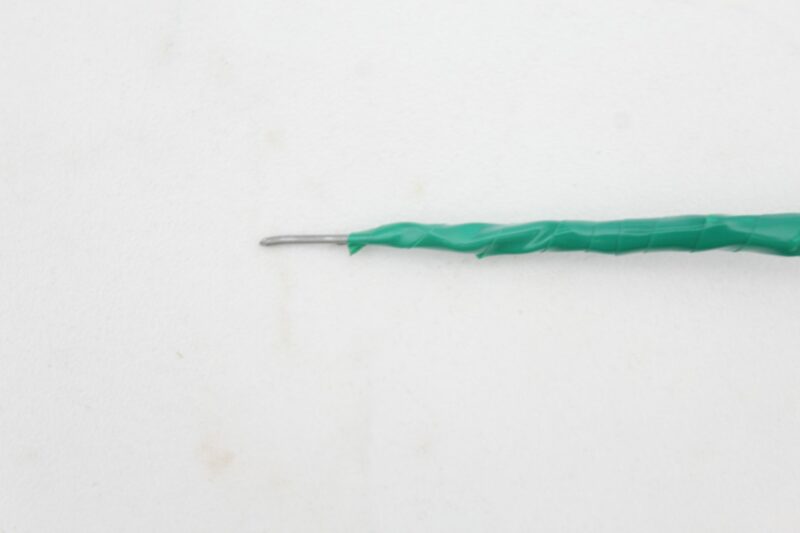 Take a small flower and using the other end of the stem, pierce the middle of the flower. 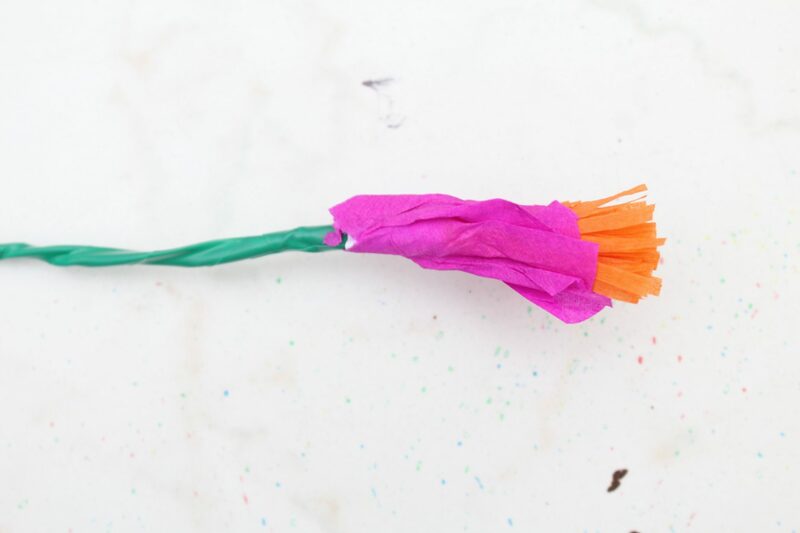 Push the flower to the top until it meets the wrapped and taped fringe. 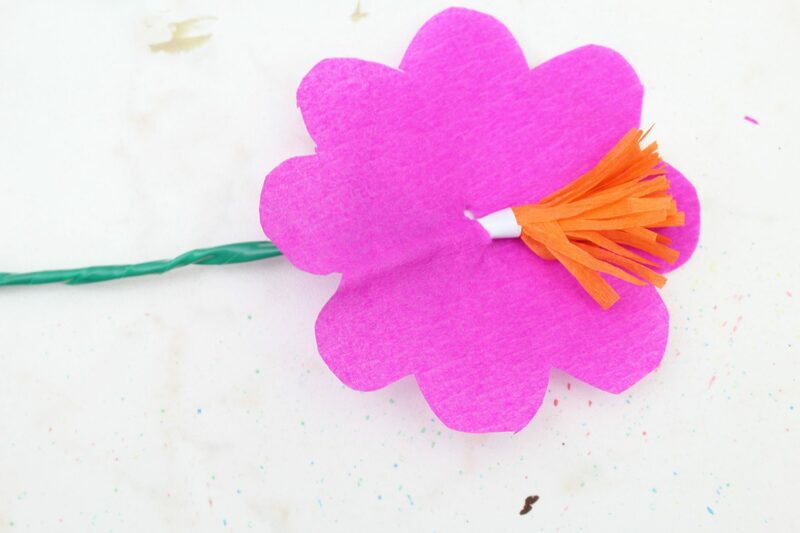 Scrunch and twist the flower then tape the base of the flower as you did with the fringe. Continue like this until all layers are attached to the stem. Open the peony and start pushing the layers of petals outward until your flower looks like you want it. Make the leaves. 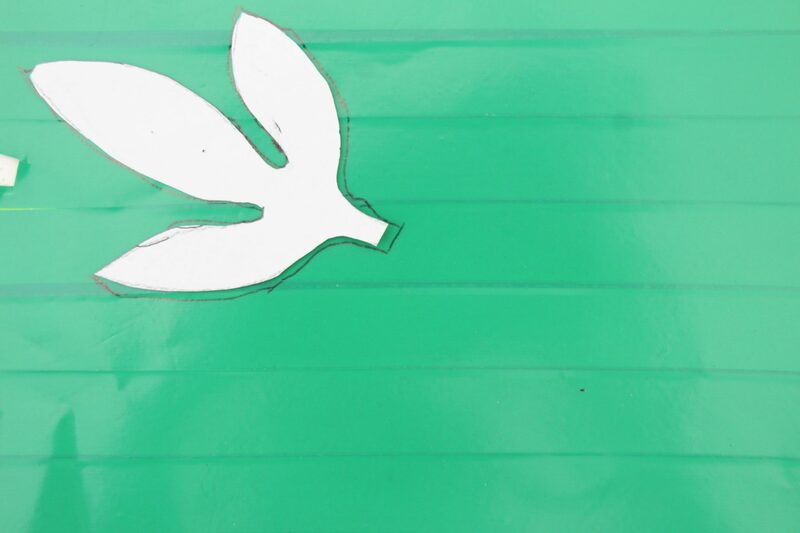 Tape some green tape over a piece of cardstock, use a pen to draw the petals on then cut them out. Attach leaves to the base of the flower and the stem. Repeat the above steps until all flowers are done then display in a vase. If you liked my tutorial please let me know in the comments below. And don’t forget to rate it! Thanks!